From the Department of Neurology (J.L.P., O.G.P.B., A.S.B.O. ), Federal University of São Paulo, São Paulo, Brazil; Department of Microbiology (C.R.R.R., C.F.M.M. ), Institute of Biomedical Sciences, and Center for Human Genome and Stem Cell Research (L.I.M.-S., F.K. ), Institute of Biosciences, University of São Paulo, São Paulo, Brazil; Mendelics Genomic Analysis (V.D.M., F.K. ), São Paulo, Brazil; Department of Neurology (W.M. ), University of São Paulo School of Medicine, Ribeirão Preto, Brazil; and Department of Neurology (F.K. ), University of São Paulo School of Medicine, São Paulo, Brazil. PNKP (polynucleotide kinase 3′-phosphatase, OMIM #605610) product is involved in the repair of strand breaks and base damage in the DNA molecule mainly caused by radical oxygen species. Deleterious variants affecting this gene have been previously associated with microcephaly, epilepsy, and developmental delay.1 According to a previous report, homozygous loss-of-function substitution in PNKP was associated with cerebellar atrophy, neuropathy, microcephaly, epilepsy, and intellectual disability.2 Recently, whole-exome sequencing (WES) performed in a cohort of Portuguese families with ataxia with oculomotor apraxia (AOA) disclosed pathogenic variants in PNKP in 11 individuals. Other clinical features in that study included neuropathy, dystonia, cognitive impairment, decreased vibration sense, pyramidal signs, mild elevation in α-fetoprotein, and low levels of albumin. This condition was named AOA type 4 (OMIM #616267), as the phenotype of AOA has been previously associated with 3 other genes: APTX, SETX, and PIK3R5.3 Altogether, these reports demonstrate the great phenotypic diversity associated with PNKP mutations. In this article, we further enlarge this variability by demonstrating that early-onset axonal sensory-motor neuropathy (or axonal Charcot-Marie-Tooth (CMT) disease) followed years later by ataxia without oculomotor apraxia can be caused by deleterious variants in PNKP. Full consent was obtained from the patient and his parents for this publication. This study was approved by institutional ethics committees. 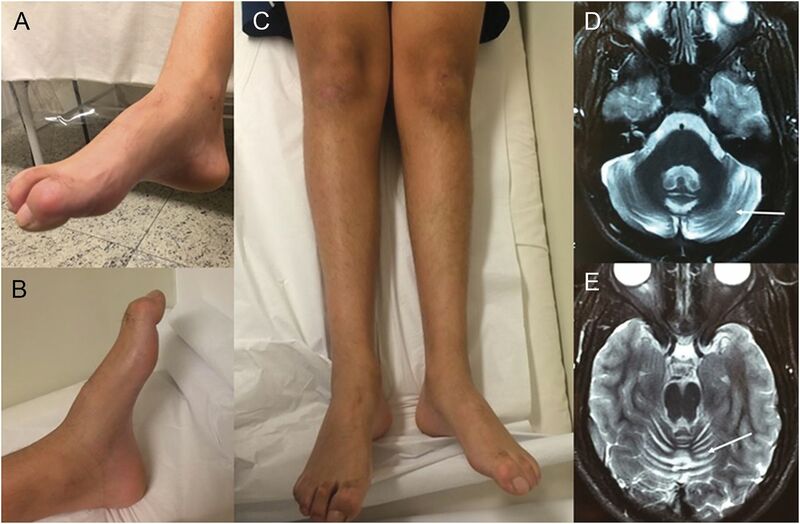 A 17-year-old boy presented with early onset of nonprogressive gait abnormalities and feet deformities observed since the first years of life. After the age of 9 years, his gait deteriorated. The combination of pes cavus, hammertoes, and absent deep tendon reflexes together with the nerve conduction velocity test and EMG disclosing sensory-motor axonal neuropathy prompted the diagnosis of axonal CMT disease; no ataxia was observed. Parents were nonconsanguineous and family history was unremarkable. Molecular analysis for axonal CMT genes, including MFN2, GDAP1, MPZ, NEFL, and GJB1, was negative. During the last 5 years, steppage gait, mild ataxia, and slurred speech were observed, and pes cavus and hammertoes became prominent (figure 1, A–C); he never had oculomotor apraxia. Brain MRI depicted mild cerebellar atrophy (figure 1, D and E). Other recessive ataxias were excluded. Note pes cavus and hammertoes (A, B). In addition, there is bilateral peroneal and calf muscle atrophy (C). These features are characteristic of Charcot-Marie-Tooth disease. Axial T2-weighted brain MRI disclosed mild cerebellar atrophy (arrows) (D, E). Recessive CMT, also known as CMT4, represents less than 10% of CMT cases. At least 22 genes are associated with CMT4, which can be axonal or demyelinating. Because clinical manifestations of CMT are usually not gene specific, molecular diagnosis is not a straightforward task and many patients remain without a genetic background.7 Next-generation sequencing will help to increase the number of genes associated with these disorders. This report expands the phenotypic variability associated with mutations in PNKP, which spans from a more severe presentation of microcephaly, epilepsy, and mental retardation at one end of the spectrum to a milder, CMT-like phenotype with ataxia but no oculomotor apraxia, epilepsy, or cognitive impairment, as seen in our patient, at the other side of the spectrum. In addition, it demonstrates that even with a milder phenotype, as occurred in our patient, DNA repair capacity is impaired on both BER and NHEJ pathways. Author contributions: Dr. Pedroso contributed to article conception, organization, and execution, as well as writing of the text and review and critique of the manuscript. Ms. Rocha contributed to functional evaluation experiments, as well as writing of the text and review and critique of the manuscript. Dr. Macedo-Souza contributed to genetic evaluation execution, writing of the text, and review and critique of the manuscript. Dr. De Mario contributed to genetic evaluation execution, writing of the text, and review and critique of the manuscript. Dr. Marques contributed to article conception, organization, and execution, as well as writing of the text and review and critique of the manuscript. Dr. Barsottini contributed to article conception, organization, and execution, as well as writing of the text and review and critique of the manuscript. Dr. Oliveira contributed to article conception, organization, and execution, as well as writing of the text and review and critique of the manuscript. Dr. Menck contributed to writing of the text and review and critique of the manuscript. Dr. Kok contributed to article conception, organization, and execution, as well as genetic evaluation execution, writing of the text, and review and critique of the manuscript. Study funding: CEPID-FAPESP, FAPESP (Sao Paulo, SP) and CNPq (Brasilia, DF). Disclosure: Dr. Pedroso, Ms. Rocha, and Dr. Macedo-Souza report no disclosures. Dr. De Mario has been an employee of Mendelics Genomic Analysis. Dr. Marques has served on the editorial board of the Arquivos de Neuro-Psiquiatria. Dr. Barsottini has been an employee of the Federal University of São Paulo. Dr. Oliveira reports no disclosures. Dr. Menck serves on the editorial board of Genetics and Molecular Biology, edited by the Brazilian Genetics Society, and has received research support from BRASKEM, Natura, FAPESP, CNPq, and CAPEs. Dr. Kok has served on the editorial board of Arquivos de Neuro-Psiquiatria, holds a patent for Methylmalonic acid determination by tandem mass spectrometry using stable isotope, and has been an employee of Medelics Genomic Analysis. Go to Neurology.org/ng for full disclosure forms. The Article Processing Charge was paid by the authors.
. Mutations in PNKP cause microcephaly, seizures and defects in DNA repair. Nat Genet 2010;42:245–249.
. Progressive cerebellar atrophy and polyneuropathy: expanding the spectrum of PNKP mutations. Neurogenetics 2013;14:43–51.
. Mutations in PNKP cause recessive ataxia with oculomotor apraxia type 4. Am J Hum Genet 2015;96:474–479.
. γH2Ax: biomarker of damage or functional Participant in DNA repair “all that glitters is not gold!” Photochem Photobiol 2011;87:1230–1239.
. UVB-induced cell death signaling is associated with G1-S progression and transcription inhibition in primary human fibroblasts. PLoS One 2013;8:e76936.
. Human DNA repair genes Mutat Res 2005;577:275–283.
. Unraveling the genetic landscape of autosomal recessive Charcot-Marie-Tooth neuropathies using a homozygosity mapping approach. Neurogenetics 2015;16:33–42.